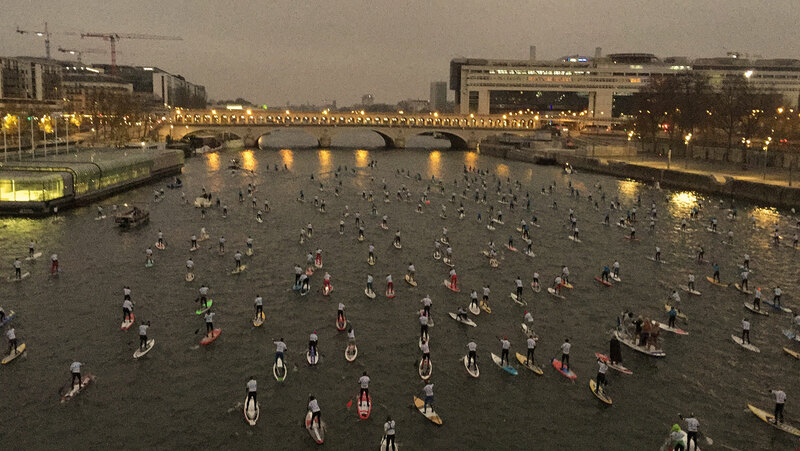 Titouan Puyo has outlasted Casper Steinfath to claim back-to-back Paris Crossing titles, as 500 paddlers hit the River Seine today for the largest SUP race in the world. Titou and Casper broke away early after a hectic start, taking advantage of the choppy conditions thrown up by the lead boats to gap their fellow contenders. The pair worked together and continually extended their lead over the entire 13km (8 mile) course, before Titou finally pulled clear in the final few hundred metres to win by 11 seconds. The one-two result mirrors what happened here 12 months ago, and gives Titou back-to-back Paris Crossing titles. It caps off a fine year for the pair, who will finish the season ranked 5th and 6th in the world respectively. Coming home third today was Arthur Arutkin, who worked hard all day alongside his chase group compatriots Gaetan Sene and young Martin Vitry, another young gun Frenchman that seems to be a real talent for the future. Behind them it was another group of three, with Paolo Marconi outlasting Vinnicius Martins and Greg Closier at the line. Former event champ Eric Terrien was up there in the top 10 early but ended up as a DNF. Meanwhile, one of the pre-race contenders, Steeve Teihotaata, ended up way back in 20th getting knocked off his board early (and falling in a few more times) to finish with borderline hypothermia. In the women’s it was former French champion Olivia Piana with a strong return to form, defeating pre-race favourite Celine Guesdon and Spain’s Susak Molinero. Olivia’s victory made it a double win for Team Starboard. The 2015 Paris Crossing was an absolutely amazing spectacle, with 500 paddlers hitting the River Seine at dawn and paddling past some of the world’s most iconic landmarks. Although I was chasing the lead pack along the banks, the true spirit of this race was happening back in the amateur divisions. 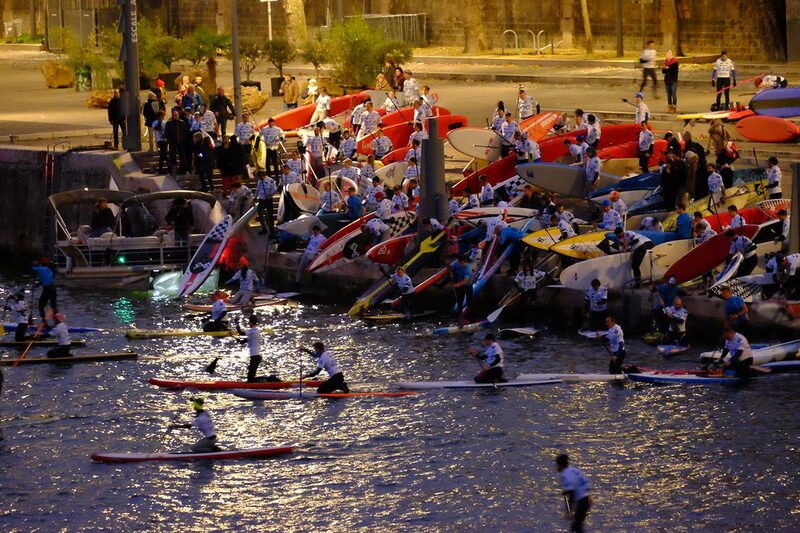 Out of the 500 paddlers on the start line, over 400 were in the open class. And that’s what’s so great about this race. It’s a race, but it’s not too serious. Oh and you also get to paddle past the Eiffel Tower, the Notre Dame Cathedral and a dozen other iconic landmarks. Now I can see why this race sold out in 26 minutes when entries opened several months ago. The spirit and atmosphere at the finish line reminds us why we love this sport so much. Everyone was stoked just to be part of it, while Titou and Casper got more “Can I please take a photo with you?” requests than I’ve ever seen any paddler at any race receive. It was inspiring to see. There was also one minute silence before the race in memory of the November 13 Paris attack victims. 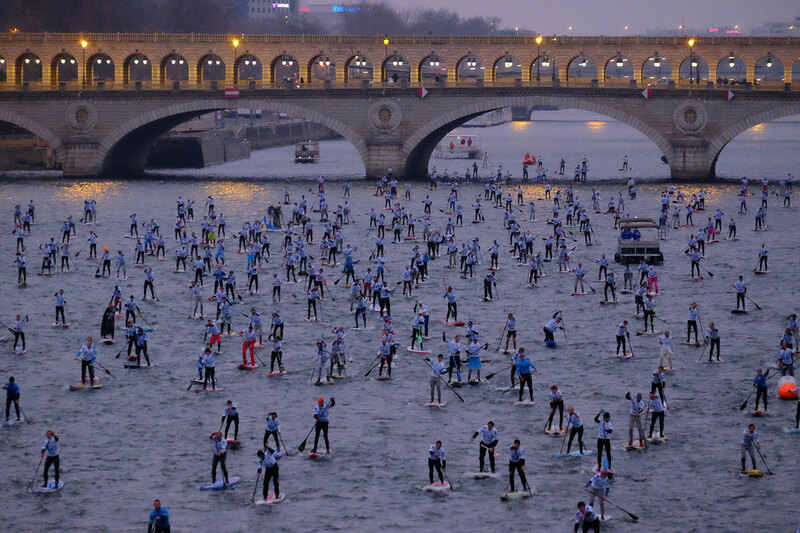 I can’t recommend highly enough that you add the Paris Crossing to your SUP bucket list. You’ve gotta get over here and do this race next year. It’s an amazing thing to witness, while I can only imagine it’s even better when you’re out there on the water. Here’s a quick edit of the action (special mention goes to the Storm Troopers that completed the race in full battle gear), while we should have more pics (and updated World Rankings) in the morning.